Perhaps Ibrahim the hitherto-faceless Moor? No. Koh hasn’t gotten him. Ibrahim has been in a few incentives and we also learned he hates snow. Um Coal? Your eyes just got freakier, juuuuuust thought you’d want to know. Haha! Sadly I don’t think he can tell. Hedda, dearest, if there is one God that is in a position to give advice on dresses – having both worn them himself and having a keen appreciation of the usual wearers – it would be Loki. …Whether it is wise to actually TAKE his advice, though, is another matter entirely. His advice is frequently more two-edged than Oðinn’s gifts. In this case, though, the dress will bring out the color of your eyes quite nicely. Listen to him. But…but… she sewed every patch herself! It’s Boho. Loki does like the frills now and then. I’m looking forward to see Loki helping Hedda find new dress. It’ll be cute. I suspect Loki may regret not having kept an eye on Coal in the process. Hahah, it would be! They’d be quite a shopping pair. Happy TMK birthday Sarah! I’m still just as big a fan of the comic now as when I found it over 2 years ago, if not more so. There are already so many reasons to love this webcomic – and things don`t seem likely to slow down, so keep rocking! I will do my best! Thank you! Looks like Coal is out to kill someone he (dimly) recognized. Hope Coal remembers it’s THOR’S DAY, and that there is no killing done in the public market during said day. Coal does what he wants! Though yeah killing Ibrahim right off the bat would be bad. Hark! A new character approacheth! 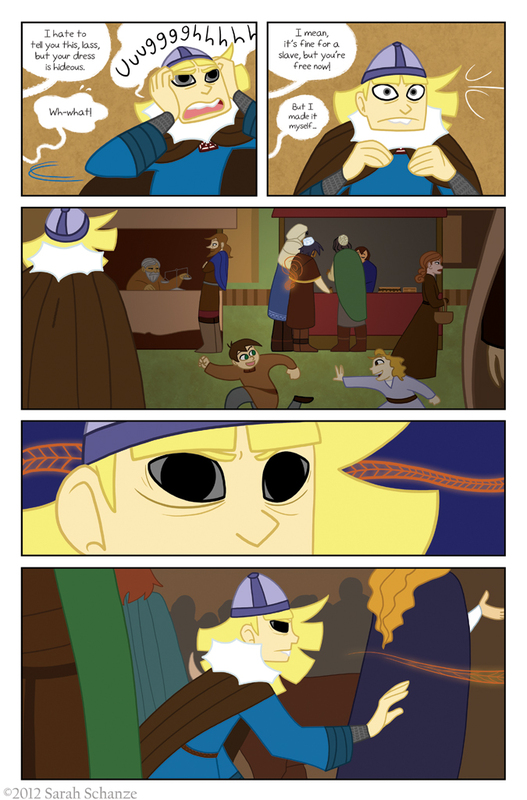 Coal’s Viking senses are tingling! Very heightened senses, he has.